Maver-backed Dave Watson has been selected to take part in this year’s Invictus Games in Sydney, Australia. Dave, who flew out to Toronto, Canada last year to represent Team GB, returned home after an unforgettable experience which saw him collect bronze and gold medals for shot put and discus respectively. Dave will fly out to Sydney in October to compete once again in shot put, discus and, for the first time, rowing and archery. The team of seventy two (72) competitors selected to represent the UK at the Invictus Games Sydney 2018 was exclusively unveiled at Horse Guards Parade. Help for Heroes are again delivering and training the UK Invictus Games team. The team of wounded, injured and sick serving military personnel and veterans came together for the first time since selection at the iconic London venue and were joined by Prime Minister Theresa May who posed with the athletes for the first official team photograph and wished them luck for the Games in October. The athletes – 64% of whom are new to Invictus – were also joined by former Team UK captains, including Paralympic Bronze medallist Dave Henson. Maver (UK)’s Dave Watson will be competing in this year’s Invictus Games in Sydney, Australia. More hopefuls than ever before, four hundred and fifty one (451) WIS military personnel and veterans, trialed eleven (11) sports for one of the seventy two (72) places available on Team UK. The rigorous selection process for Team UK was based on the benefit the Invictus Games will give an individual as part of their recovery, combined with performance and commitment to training. Speaking immediately after his team selection had been confirmed, Dave commented “I’m lost for words to have been selected for Team GB for a second year running. Last year saw me selected to represent Team GB for the first time in Toronto, Canada and it was an amazing experience“. “I believe that taking part in the Invictus games 2017 helped prove how far I have come since injury. I was disappointed when I wasn’t selected in 2016 but took it as a challenge to continue to improve. Taking part in the Games gave me the chance to become part of a team all working for the same goal again as I have not had that since being in the Army. I can’t wait to compete again this year and look forward to taking part in more sports“. Army Veteran Dave lost both legs and an arm in Afghanistan back in 2010. Despite suffering horrific life-changing injuries, his recovery appeared to be going well until a problem with his prosthetics set him back massively, restricting his mobility and confining him to a wheelchair. 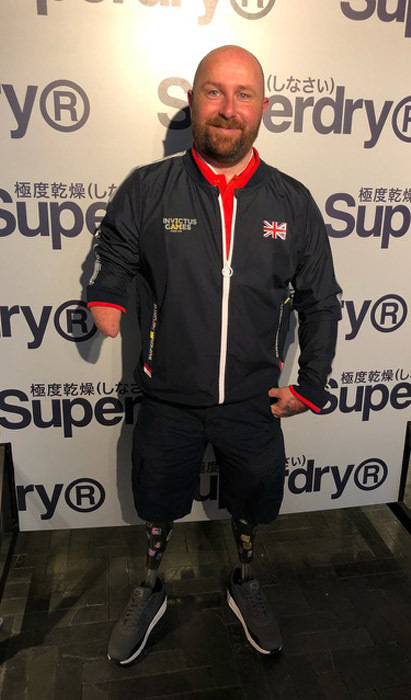 An operation eighteen months ago, however, saw him regain the use of his prosthetic legs, and he has since gone on to achieve everything he has set out to do. The trip to Sydney with Team GB is a particularly poingnant one for the ex Preston North End man as it was where Dave underwent his radical transformation which has since helped him achieve what he has to date – that and sheer determination! Good luck from everyone at Maver (UK).